After I piled up a whole bunch of little lampwork spacer beads last month, a group of my girlfriends and I decided to get together for a sleepover. Yeah, I know...but really, we're NOT too old to be doing that. I asked them if they wanted to do a really simple little project and the answer was unanimous. Great! Now, what to do, what to do? Earrings. Always popular, super easy. I packed pairs of spacer beads in lots of different colors (more than shown here...the favorites have already been grabbed! 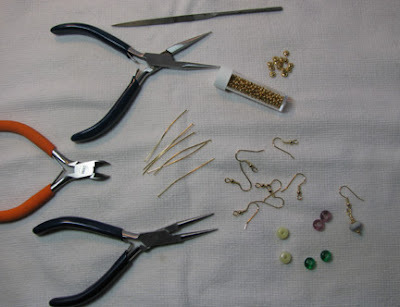 ), head pins, 2 mm rounds, flat metal beads, ear wires, and the tools, and we all had at it! So easy. 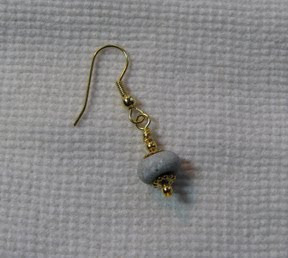 Just slide a 2 mm round, a flat metal bead, a lampwork bead, another flat metal bead, and another round on a head pin. 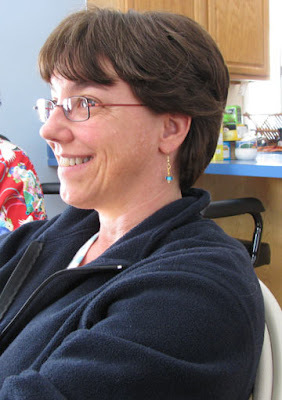 I demonstrated wrapped loops and how to open the ear wires without distorting the loops. That was about it. Everyone got a new pair of earrings in no time! What a fun idea for a girls get together!